The band of silver paleness along the eastern horizon made even the distant parts of the Great Plain appear dark and near; and the whole enormous landscape bore that impress of reserve, taciturnity, and hesitation which is usual just before day. The eastward pillars and their architraves stood up blackly against the light, and the great flame-shaped Sun-stone beyond them; and the Stone of Sacrifice midway. Presently the night wind died out, and the quivering little pools in the cup-like hollows of the stones lay still. So of course I bought the book, and of course I didn't read it. Until now, as it's on my Classics Club list. Tess is one of the more affecting books I've ever read--I actually stopped reading it for a couple of weeks, because I was getting so emotionally involved, and I didn't want to face the next disaster looming on Tess' horizon. 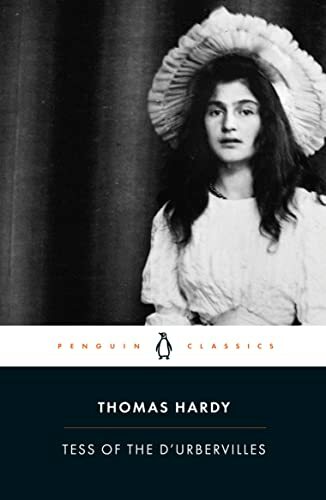 Why was I more moved by her than by, say, Helen in The Tenant of Wildfell Hall, who was equally blameless and equally unfortunate? Maybe it's because Helen was more of a device than a woman--Anne Bronte made her almost impossibly saintly, clearsighted, and resolute, probably to further her feminist message. Tess, on the other hand, while both intelligent and good, comes off as rather hapless, and at key points in her life, makes tragically bad decisions. Her character is more complex, and felt more affectingly human to me. ...beings of many minds, beings infinite in difference, some happy, many serene, a few depressed, one here and there bright even to genius, some stupid, others wanton, others austere; some mutely Miltonic, some potentially Cromwellian; into men who had private views of each other, as he had of his friends; who could applaud or condemn each other, amuse or sadden themselves by the contemplation of each other's foibles or vices; men every one of whom walked in his own individual way the road to dusty death. They stood fixed, their baffled hearts looking out of their eyes with a joylessness pitiful to see. As great a novel as Wildfell Hall is, Tess is the one that caused me genuine grief. I just read Tess for the Classics Club, so I was looking for reviews of it by other CC members. This book was much more difficult to get through than I thought it'd be, precisely because of the genuine grief that you described here. I'm glad I wasn't the only one who had this problem. Also, that's an interesting note about Stonehenge! I like that the tourism people included that little tidbit about Tess in their audio tour. And yes, Hardy does have an amazing talent for description.